Here is the beginning of my adventures into wired armature. For the upcoming creation, it would be ideal to bring to life a doll that has, at the very least, legs that are bendable at will. This means the doll can be posed to sit with bent knees and then stand again with straight legs. The only way to do this is by constructing the doll with armatures. I am new at this, as I am new with pretty much everything that I've created, since I make it a point to learn something absolutely new to me with each creation. So, I won't get into the details of telling you about wired armatures because I'm no expert at it. I've done my research to learn about the different types of armatures and how to construct and piece together the armatures. Here I've decided to start my adventures with armatures by using cotton pipe cleaners. In this blog, I just wanted to share a few photos of the beginning constructions of the wired armature in order to preview the upcoming doll and show a bit of what the doll is composed of. The challenge here is the process of inserting the wired armature inside the cloth, intact and well secured with wool stuffing generously and evenly wrapped all around the wired armature without the aid of glue or any other type of synthetic materials. AND to do this while navigating the angle met at the ankles of the doll's leg. 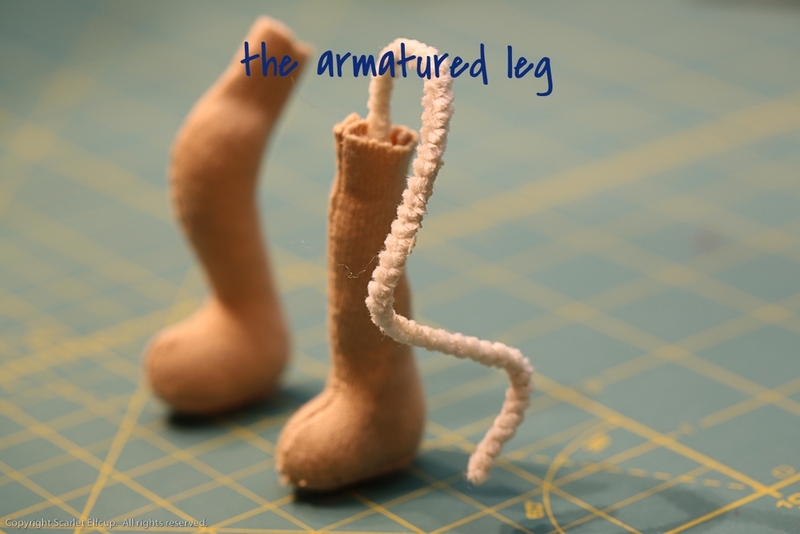 In addition, the challenge will also lie in sewing the legs to the body through the wired armature. These, my friends, are the challenges. I'll let you know how we come through at the end. Wish this doll luck that he/she will come to life with legs that can bend, sit and stand.